At the installation meeting of Widnes Chapter No 2819, held in the McCausland Suite at Widnes Masonic Hall, the companions welcomed as the principal guest David Barr PrGScribeN as principal guest and representative of the Grand Superintendent Tony Harrison. The first principal Brian Magan opened the chapter and following a ballot Ian Black PrGStdB was admitted as joining member. 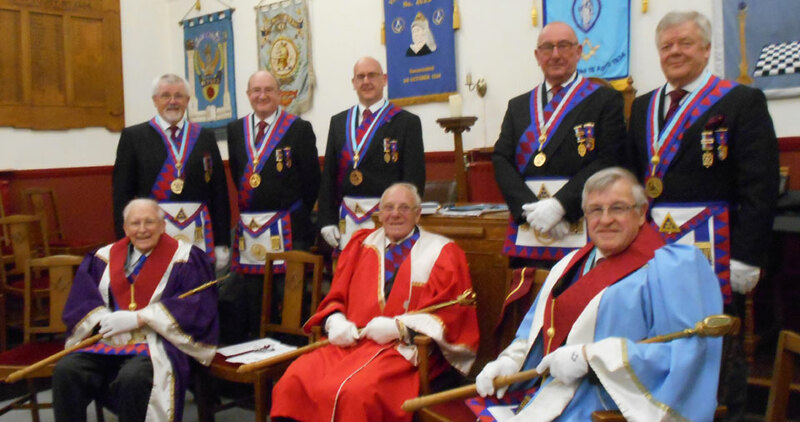 Following the three principals welcoming David Barr, a very sincere and enjoyable installation took place with Arthur Jones being installed as first principal, Tony Tallon being installed as second principal and Ian Black being installed as third principal. The appointment of the chapter officers then followed. The robe addresses were delivered with sincerity by Ian Gillespie, Frank Thomas and Tony Tallon. At the conclusion of the ceremony, David Barr delivered the congratulations and best wishes, on behalf of the Grand Superintendent. Replying, the three principals presented David with a cheque for £100 as a charity donation for Senses Charity for Disabled Children, for which David thanked the companions on behalf of the recipients. Pictured from left to right seated, are: Tony Tallon, Arthur Jones and Ian Black. Back row: David Barr, John Gibbon, Ian Lynch, Neil Pedder and Chris Reeman. A very delightful and relaxed festive board followed in the Peter W Browne Suite, during which David Barr brought his own greetings and congratulations to the three principals. The evening festivities were brought to an end by the acting janitor delivering the janitor’s toast.